Bitcoin Is Bouncing Around Again. Here Are Some Possible Causes Bitcoin is known to be volatile. But recently it has suffered a rash of notable losses. Analysts are looking to the amount of computing power used and the split of a rival cryptocurrency for answers. 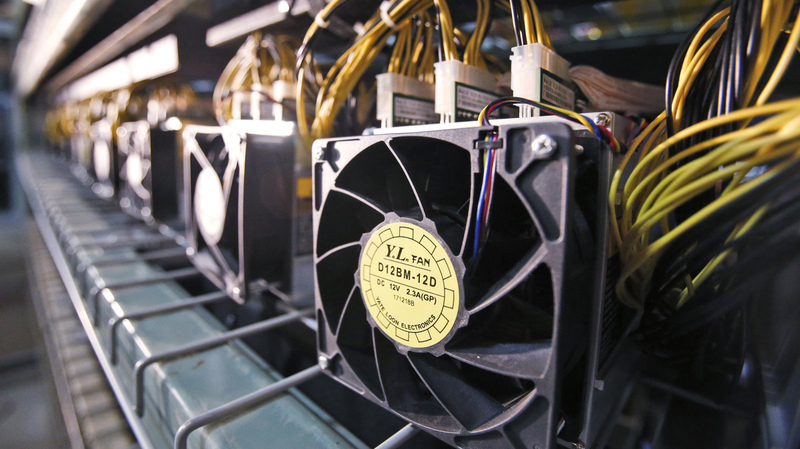 Fans used to cool bitcoin data miners are hooked up in a bitcoin data center in Virginia Beach, Va., in February. Bitcoin has lost a lot of its value this month. Financial experts aren't sure why. And they're not sure where the popular cryptocurrency will go next. Prices fell last weekend, reaching below $3,600 at one point — about 40 percent less from where it had been just two weeks earlier. Prices continued down Monday but closed slightly up Tuesday. Then they surged, topping $4,300 Wednesday — though that's nowhere near the $6,000 or more the cryptocurrency commanded for several months until mid-November. Bitcoins are not physical objects like dollars or gold. They exist only online. Bitcoin users are kept in line by a distributed public ledger called a blockchain, which serves to verify transactions. Bitcoin is just one of hundreds of so-called cryptocurrencies, which have many of the same decentralized characteristics. Bitcoin in particular has gained a lot of attention over the years. It's the first and the most popular of the cryptocurrencies. The highlight was back in December 2017, when bitcoin prices soared to an all-time high of nearly $20,000 each. Seeing prices go up, investors jumped on the bandwagon. Bitcoin exchange site Coinbase reported an "explosion of interest in digital currencies" that month. Another exchange, Binance, said it registered 240,000 users in a single hour in January. It's hard to gauge exactly how many people have money in cryptocurrencies, but a study last year from the University of Cambridge put the number between 2.9 million and 5.8 million. In May, investor Chris McCann estimated the worldwide cryptocurrency user base at between 20 million and 30 million. As prices fell from their peak early this year, financial experts argued at various points that bitcoin was a bubble that had burst. Experts say the downturn that started two weeks ago could be related to a few different factors. Some reports blamed investor skittishness on a recent split among an offshoot of bitcoin called bitcoin cash, which has the fourth-highest market capitalization among the cryptocurrencies. Different backers of bitcoin cash came to a disagreement on updates they wanted, leading to two separate forms of the cryptocurrency. "The bitcoin cash split was the catalyst for the decline, but I don't think it alone is responsible," Craig Erlam, a senior market analyst at Oanda, told NPR. "Bitcoin has looked vulnerable for months," he said in an email. "Each major rally was weaker than the last which suggested sentiment was gradually becoming more negative." The website the LongHash blames much of the beginning of the drop this month on problems associated with the Hong Kong-based cryptocurrency exchange OKEx. Another possible clue lies in the computing power involved in making bitcoin. It's called the "hash rate." It shot up in the past year, reaching highs in late August through mid-October, according to tracking by Blockchain.com. Bitcoin makers, also called miners, use massive computing power — and electricity — to solve complex math problems which underpin the blockchain. They are rewarded with new bitcoins. But if the price of bitcoin falls below the cost of making it — costs like electricity bills — then miners may switch to alternate cryptocurrencies or give up altogether. The hash rate has started to go down in the past few weeks, suggesting bitcoin mining may be growing uneconomical for some. Despite the drop from great highs in late 2017, bitcoin is still worth more than it was at the start of last year. It started January 2017 at $963.66, according to CoinMarketCap.com data. Erlam, the analyst, says the fact that bitcoin is still up more than 300 percent from early 2017 either "represents considerable gains or far more potential downside ahead," and adds, "I think it's probably the latter." Aside from any recent developments, Harvey says bitcoin is just unstable. "With bitcoin, you've got some people that fundamentally believe that it's worth zero. And others that fundamentally believe that it will soon be worth $1 million a coin," he says. "So that is a massive amount of disagreement and uncertainty. It translates into extreme volatility." By comparison, the Dow Jones Industrial Average lost at least 4 percent on two days so far this year. Bitcoin lost at least 4 percent on at least 50 days on one exchange. Harvey says bitcoin is four to five times as volatile as the stock market.